random Archives - Gabhart Investments, Inc.
Why Am I Not Succeeding in Real Estate? What is the amount of net cash flow of debt-free income properties [units] nationally divided by the number of individual private investors=what amount? That number would be ROI or cap rate. Do the similar math for total residential real estate commissions earned nationally divided by the number of licensed agents = what amount? Again, either some assumptions or raw data might be used. Take the ‘average profit/gain’ from residential sales nationally by investors both seasoned and newbies who either do wholesale flips or forced appreciation thru retailing. The ‘newbies’ would include those who have not done any deals yet. 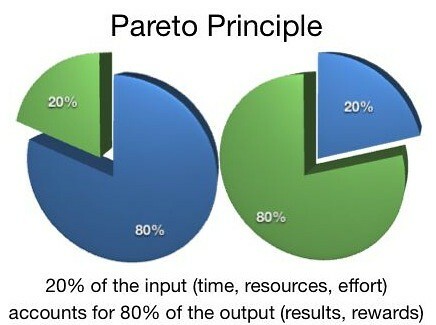 In another post I came across, someone commented on the 80/20 rule (Pareto principle) which in summary states that, for many events, roughly 80% of the effects come from 20% of the causes. Personally, I like this rule, whether it is exact or not the principal is good. 80% comes from the 20% which helps keep me focused on the 20%. Another posted that they read 95% of would be real estate investors lose money on their first deal then quit. Similarly, think about how many small businesses go out of business in the within 1, 2, 5 years of operation. So after some more bantering about exact numbers and the 80/20 rule really being a 96/4 rule or a 60/40 rule my response was this. Can someone else do it and how did they do it? Can I duplicate what they are doing through hard work, perseverance and a little luck sprinkled in? In what time period can this happen? I don’t want it to be easy because things that are easy that everyone can do get compensated less. i.e. digging ditches vs. finish carpenter. You can be a mom & pop investor who buys a house here or there while working and have a great retirement. Or you can become Sam Zell who started buying student housing in Chicago while going to college who then was brave enough to acquire lot’s of property during a downturn while others were selling. Real Estate can be your business, or just an investment vehicle. I would say the ratio of success and failure really depends on how soon and quick you try to make it your business. People who try to immediately make it there business without any other means of income I believe exponentially increase there chances of failure. They fail like the majority of business’s they become under-capitalized and can not meet their overhead obligations. They usually have no experience and lack of money – 2 things that are most often the cause of failures for businesses. Real estate really is a simple business but it takes a tremendous amount of effort and hard work (like most business). What I find happens is everyone wants to be a millionaire…. Until 5pm hit’s and they want to go home or the alarm goes off at 4am and they decide to show up at 9am, or until it doesn’t work out exactly how they plan (hint – it NEVER does). You get all these gurus and infomercials talking about how easy it is and you need NO money and NO credit to succeed. Well that may be true just like you can start a company that then becomes Google (obviously the odds are better than starting a Google but you should get the point). Well there is my rant that really gave no answers to your numbers. The reasons for many of the failures are stated above. p.s. Here is a question for your question… Do you fail when you do not accomplish your goal or when you give up and stop trying? I got this as an email and thought it was cute. In real estate advertising, as in any other, misleading statements abound. Some realtors try to put positive spins on home features that are somewhat less than positive. Please don’t misunderstand me. A conveniently located, cozy and charming home with easy highway access that needs a little TLC might be a great starter home for a family with a little bit of paint. Sadly, too many realtors use these words in other ways. In fact, a leading real estate trainer actually promotes using the term cozy instead of small and charming instead of old as a method of attracting buyers. This practice is called puffing. The following is a list of some of the best examples of inappropriately used words. Cozy “ One of my favorite terms. It means the home is too small for human habitation. Remember the 19th Century when a family of six could live in a single room home? This is the home for them. Intimate“ The only home smaller than cozy. These homes are perfect if you’re roughly the size of a garden gnome. Charming “ If you’re used to living without indoor plumbing, this home is perfect for you. It comes complete with old woodwork, wide molding, and kitchen cabinets that date before the Great Depression. The cobwebs are an added bonus. Conveniently Located “ It is located at a busy intersection, where the traffic noise is so heavy, you’ll have to sleep with ear plugs. Easy Highway Access “ This is actually worse than Conveniently Located. Here you’ll have to sleep with pillows duct taped to your head. Country Living “ We hope you like spending a lot of time driving because this home is located so far from civilization that you may have to raise your own animals in order to survive. City Living- Lock the doors with all three deadbolts because it’s not safe to go outside. Needs Some TLC “ Beware. You might fall through the floor. Water View “ If you stand on a ladder in the corner bedroom of the second floor and lean out the window, you might be able to see it. Water Front – Located in a flood zone. Not a Drive-By “ Because the exterior is so hideous, you’re likely to drive by without stopping. You might even look over your shoulder to see if condemned signs have been placed in the yard yet. Must See The Inside “ This is a variation of Not a Drive-By. The outside looks like it’s been decorated for Halloween, but it’s currently March. The Addams Family actually turned this home down. Handyman Special “ So special that not even the walls are solid. The home is probably ready to collapse. Unique “ This home is so unique that it will only appeal to a small percentage of the population. In fact, the number of buyers who would appreciate the architecture is so small that we’re still hoping some weird person from southern California takes a job relocation and moves to the area. Easy to Show “ The prior owners vacated the home as soon as they heard the gunfire down the street. The doors don’t shut properly, so pretty much anyone can go in anytime they’d like. Only One Owner “ And he didn’t make an update since the day he built the home forty-seven years ago. Freshly Painted “ With a single coat of cheap paint. Cul-de-sac Living “ A fancy way to say you’ll be living at a dead-end. Friendly Neighborhood “ In fact, several busy bodies will watch your every move and the creepy guy across the street has a telescope trained on this home at all times. Do you have any you want to add? San Diego wants to spend $31 MILLION to house 225 homeless. HOW MUCH??? Protesters delay downtown homeless center – SignOnSanDiego.com. Wow the city of San Diego wants to spend $31,000,000 to house ONLY 225 people in the world trade center building in Downtown San Diego. This $31,000,000 is not to build new construction but to use an existing structures top floors for permanent and temporary housing. I am all for helping the homeless and in particular the homeless who want help or need help due to handicaps or mental illness. Don’t get me wrong that it is not an important issue to me. My best friend died when about 14 years ago homeless (age 21) and alone so it is something near and dear to me. Chris turned out to have mental problems and did not get the help he needed and could not deal with everyday life like the rest of us. As far as my understanding of this proposal for housing the homeless 1) this has no mental health component. Mental issues and drug rehab are probably the biggest things that need to be addressed and are probably the most expensive to deal with. This is just for housing which is great as long as the person they are trying to help WANTS to get help (if they are capable) and be a contributing member of our society. If that is the case there should be help and housing. But they are only able to help 225 peopleÂ for $31 MIIIIIIIIIILLLLLLLLLLLIIIIIIIOOOOOOOONNNNN DOLLARS!!!!!! Can’t that money be put to much better use and help a lot more people? How about all the homeless who won’t get help because they didn’t utilize that money effectively. Why don’t they rent out the office building which is a prime high rent area of downtown (assuming they own it. If they don’t there are cheaper places that could then house more people. It’s not like they need the lap of luxury just food, shelter, and safety to start with) San Diego and use the income that is generated on an ongoing basis and which will grow in addition to the $31 million and use the money more effectively. They could probably buy the old hospital that is not in use in El Cajon and house hundreds more? Or for $31 million they could buy about 364 apartment units around San Diego and own them free and clear. That would be $85,000 per unit which is possible in this market. That assumes NO debt (loan) and they could use the proceeds from the world trade center business to pay for operations. If they financed the purchaseÂ at a very low loan to value of say 50% and 4% government interest they could buy almost 800 units and if there was an average of 2 people per unit would house over 1600 people. That’s 40% of the estimated 4000 +/- San Diego homeless population according to the article. You could have different buildings for the different stages people were in and also in different parts of the county so people could live closer to where they found work. If you live in downtown how are they going to be able to commute to a job opening in Oceanside if they got it? If some of the units were in North County the people who worked in North County could live there, etc. Stage 1 – Straight from the streets. This is where they would have a chance to get food and shelter. Acquire clothes, education and job training. To earn there keep they would need to volunteer and work for free as they were being trained but would not have to pay for food and shelter. Stage 3 – Less subsidy to the person and eventually they could be a contributing part of our society. Hopefully they could help others and encourage others who were in there situation. Rules would be no drinking and drugs. they should be tested. They must slowly start to contribute to earn there keep. No free ride if they don’t have mental issues or major handicaps. If they are handicapped they should contribute to whatever level is appropriate depending on the handicap. Like most things in life it would not be this simple and this does not address the mental health issues or drug rehab. The point is that $31 million can be spent so much better in helping this cause. The Government is not good at managing money and this is a perfect example. They have so many resourcesÂ which they waste, primarily in OUR tax dollars. But when it comes to there salaries (a tree trimmer makes over $75,000)Â and pension benefits it is a joke. The bottom line is it always easier to waste other peoples money. I was using stumbleupon which is a really cool site which as they claim “Discover the Best of the Web in less time” is true. StumbleUpon helps you discover and share great websites. As you click Stumble!, we deliver high-quality pages matched to your personal preferences. These pages have been explicitly recommended by your friends or one of 8 million+ other websurfers with interests similar to you. Rating these sites you like ( ) automatically shares them with like-minded people â€“ and helps you discover great sites your friends recommend. Anyways it is a great tool to search the web for great content and is where I ran across this interesting video that plots the housing market since 1890 from a roller-coasters perspective. Don’t miss the end.